In September each year Brisbane Riverfire lights up the city sky. The stunning display of pyrotechnics is choreographed to music and is the biggest in Queensland. 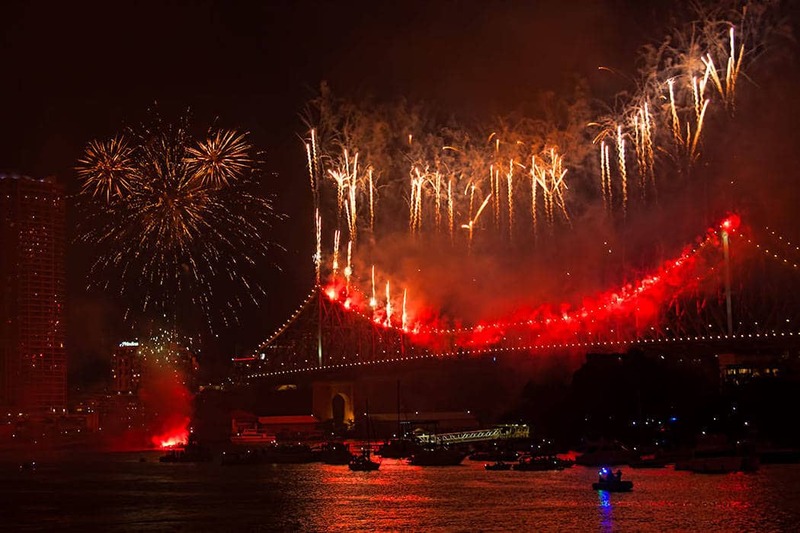 The fireworks cap off three weeks of festivities as part of the Brisbane Festival with sparks flying from buildings, barges and bridges all across the city. The spread of the display ensures there are dozens of public vantage points right across the city to accommodate the 500,000+ people who turn out to watch each year in addition to the many restaurants, commercial buildings and private homes with a fortunate vantage point. In the lead up to the main event firing off at 7pm there’s live entertainment at several venues and the Australian Defence Force provide dramatic flyover demonstrations with both helicopters and Super Hornets. Over the years we’ve viewed the event from Southbank, Eagle Street and more recently from friends strategically placed Kangaroo Point apartment. While the luxury of a private veranda is a definite treat don’t let the expected crowds and traffic put you off. We’ve driven into the city for it a few times and caught the train from both the Gold Coast and Brisbane suburbs, it’s worth making the effort and you don’t need to stake out a spot hours in advance unless you really want to. The Southbank Parklands which are well positioned for the barges and city buildings. They have the advantage of lots of entertainment through out the afternoon making it easy to arrive early and stake out your spot for the evening. They are also well positioned for food & drink, toilet facilities and public transport. They are probably the most popular spot. The Riverside centre and Eagle Street pier are also popular. You can position yourself for a great view of the Story Bridge which I think regularly has the most dramatic display’s, I love the waterfall of sparks that has been done in various years. There are outlets here too for refreshments and limited public toilets. As an alternative consider booking dinner in one of the elevated restaurants along the riverfront for an uninterrupted view. Kangaroo Point Cliffs offer a long expanse of viewing opportunities and the benefit of elevation overlooking the city and river below. Again there are refreshment and facilities here making the wait more comfortable. It’s always great to know the best vantage spots. Looks quite spectatcular! It’s an impressive show and they always seem to be able to pull out something new each year for an extra wow factor. I love how it brings the city together for a night too.